Karlsruhe, Germany, November 12, 2015 – Today, EIZO GmbH is announcing an essential functional upgrade for the Large Monitor Managers LMM0802 and LMM0804. These products enable digital images from different sources to be flexibly arranged on a large screen monitor or on numerous monitors. The new functions offer simplifications in the respective area of application (control room, interventional radiology, cardiology, and surgery) as well as additional input channels and outputs. Aside from the current functions, such as flexible image display and definition of various image combinations, one of the new functions now allows LMM to save preferred scenarios from different users so that the desired work environment is immediately on hand. An upgrade package that includes extra inputs and outputs was developed for the Large Monitor Manager. Another part of the upgrade package is a matrix that accommodates 16 digital inputs as well as 2 interface groups with DVI, PAL/NTSC (Phase Alternating Line/National Television Systems Committee) and analog connectors. Resolutions of 1920 x 1200 can be processed with the inputs. With the LMM0804 upgrade, a maximum of 12 signal sources can be reproduced simultaneously on a maximum of nine connected monitors. Images can be combined and arranged on four of the connected monitors while the other five monitors directly display one of the digital image sources (loop-through mode). Aside from one 8 MP monitor or two 4 MP monitors, the LMM0802 enables an additional four monitors to be operated at a maximum resolution of 1920 x 1200. The Large Monitor Manager can be controlled through different interfaces. Users can operate it either with a keyboard and mouse directly on the image manager or with a touch screen monitor. With a computer connected to the network, the Large Monitor Manager can be operated through a standard Web browser. 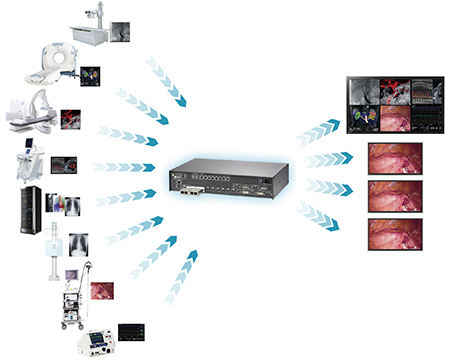 Another network interface allows the image manager to be automatically controlled, such as through an X-ray system. The upgrade package including new functions for LMM is now available. Please contact the EIZO subsidiary or distributor in your country for more details. Visitors to the Medica trade show (November 16-19, 2015) in Düsseldorf, Germany, can see the new product functions for the first time at the EIZO booth, Hall 10, #H41. All product names are trademarks or registered trademarks of their respective companies. EIZO is a registered trademark of the EIZO Corporation.